Just Bambinos Product Articles and Blogs: REDUCING THE RISK OF COT DEATH. REDUCING THE RISK OF COT DEATH. ﻿REDUCING THE RISK OF COT DEATH. Every parents nightmare, from the time of conception, is that of the risk of cot death or Sudden Infant Death Syndrome. Although this is the most common cause of death in the neonate, it is important to remember that ﻿it is still rare. Saying that, there are just over 300 newborn baby deaths attributed to cot death every year. 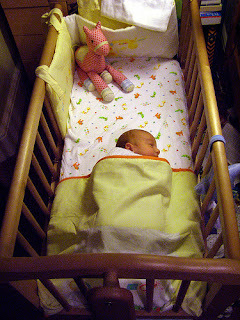 Cot deaths mainly occur when baby is sleeping, although not always at night. Baby may be having a nap at any time of the day. It is also apparent that cot deaths mainly occur during the winter, although the reason is unclear. 1. More boys than girls seem to be affected. 2. It's highest in babies of mothers under the age of 20 years. 3. It's higher in babies whose birthweight was under 5.5lbs or 2.5kg. 4. It's higher in babies born prematurely or under 37 completed weeks of pregnancy. It is therefore important that you try to lower the risk of cot death when you can by following some simple suggestions that have been thoroughly researched. Most people will be aware of the "Back to Sleep" campaign. This advises parents to put their babies on their backs when putting them down to sleep at any time of the day or night, and also laying them towards the bottom of the cot so that they cannot wriggle down under the covers. This is due to babies being unable to control their body temperature and becoming too hot, maybe having a febrile convulsion, especially if they have been a little unwell. You should also monitor the room temperature. The ideal temperature is between 16-20 degrees C or 65 degrees F. There are several very good room thermometers on the market today, but try to buy one that has been endorsed by FSID (Foundation into the study of Sudden Infant Death Syndrome). Also, to help maintain the optimum temperature for sleeping, don't overdress your baby and use lightweight layers rather than duvets or quilts, especially when baby has been a little unwell. Take care if you swaddle your baby, as they may become overheated and not have the ability to move and shuffle their swaddle blanket loose. Use the correct size and Tog if using a baby sleeping bag. It is important that you don't bed share with your baby especially if you or your partner smoke. Contact NHS Pregnancy Smoking Helpline on 0800 169 9 169 if you want help and support in quitting! Indeed, you should not let anyone smoke in the house including visitors, so ask them to go outside or better still, ask them to refrain from smoking at all. After all, it will be beneficial for them too. Smoking during pregnancy greatly increases the risk of cot death but help is available through your midwife. You should have your baby in it's own cot or crib in your room from birth to 6 months, and never sleep with your baby on a chair or sofa as this can lead to suffocation. Always try to breastfeed your baby if you can as this may reduce the risk of cot death. Breastfeeding passes on immunity therefore increasing your baby's resistance to infections. Make sure you take your baby for regular check-ups, and keep up to date with their immunisations - your GP, midwife or Health Visitor will be able to advise you on this. Make sure your baby's head is uncovered when you put your baby down to sleep therefore ensuring they don't suffocate or become overheated. There has been some research that suggests the use of a dummy can reduce the risks, although more research is necessary. This is due to the belief that the use of a dummy may help to strengthen the nerves that control the upper airway, although this is not definite. Using a dummy isn't advocated when trying to breastfeed so if you do decide to go down this route, always make sure you don't offer your baby a dummy until breastfeeding is established. This usually takes about a month. Don't force your baby to take the dummy if they don't like it and don't wake them to put it back in if they are sleeping. Try to wean them off the dummy before they are 1 year old as the risk of cot death is greatly reduced by then. It is also important that the mattress for the cot is clean and dry, preferably new. It should be waterproof and contain no holes,tears or cracks. It should also fit the cot so there are no gaps or sagging in the middle. The space between the cot and the mattress should be no more than 3cm and the gap between the cot bars should be no more than 6.5cm. So check if you inherit a cot from someone even if you buy a new mattress. Never use pillows, cushions or beanbags and don't put your baby down to sleep on a waterbed. Make sure you know and use the new correct guidelines for the storage of formula milk if you choose to bottle feed your baby and ensure you wash your hands before doing any bottle preparation or indeed handling your baby. It is important to seek medical advice if your baby appears unwell in any way. Babies can deteriorate rapidly, therefore look for the signs and symptoms such as being a little floppy, pale or less active than usual, or if you notice baby has a high pitched cry as this may be a sign of infection. It may not be anything serious but its better to get things checked out. It's better to be safe than sorry. You will need urgent medical attention if your baby stops breathing, is unresponsive or has a fit. In this instance, you should dial 999 and ask for an ambulance. Lastly, some parents request the use of monitors for their baby when sleeping for reassurance. However, there is no evidence to prove that the use of these monitors prevent cot death. If you think this is an option to you, then discuss this with your GP who will be able to advise you. REMEMBER-COT DEATH IS RELATIVELY RARE. So enjoy your baby's early years and ask your Midwife, GP or Health Visitor for any advice. What's the reason not use pillow? My baby had flat head and doctor recomended to use the safe pillow with TUV safety certification (anti-suffocation). Hi, thanks for your comments. The Foundation into the Study of Infant Deaths recommends that pillows and duvets are not used for children under the age of one year. This is due to several reasons. The baby may become overheated if using a pillow which could cause a febrile convulsion. They could also roll off the pillow and being unable to right themselves, they may become trapped between the mattress and the cot sides. Placing baby to sleep on their backs without a pillow has been proven to greatly reduce the incidence of cot death therefore this is the advice i would always give. You may read about pillows being used in other countries that have a lower incidence rate of cot death than the UK, but this is probably more to do with their higher numbers of breast feeding and lower smoking rates. If you do choose to use a pillow, I would advise that your baby is always supervised, and to reduce the effects of Flat Head Syndrome, you should let your baby spend some time on their tummy when supervised. I hope this helps.